The Art Exhibition and Sale is Hilltop’s annual fall fundraiser that brings together Hilltop families with focus on one of the school’s prized subjects, art. It’s a wonderful opportunity for Hilltop families and friends to gather together at the beginning of the school year and enjoy a night of art, food and wine tasting. 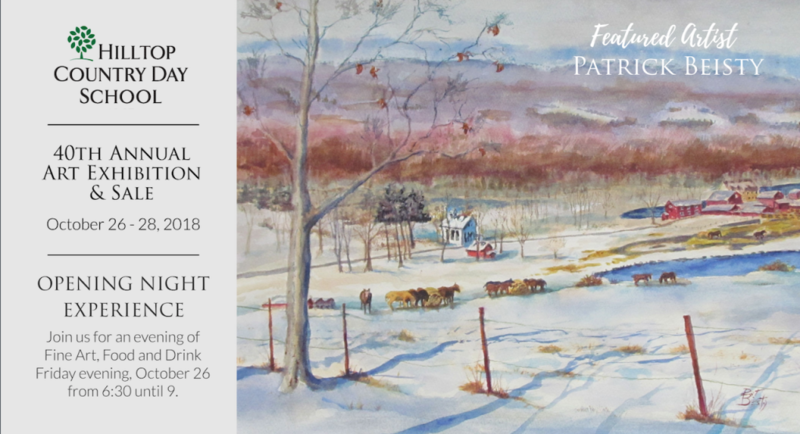 Join us for the Opening Night Experience with the 2018 exhibitors, including Featured Artist Patrick Beisty. A night of celebrating fine wine, food and the arts in Sussex County. Join us 6:30 – 9 PM on Friday, October 26. Tickets are $40 in advance or $50 at the door. Please email dgeorge@hilltopcds.org for ticket inquiries.